Started way back in 2014 - Zostel Agra is located at a short 10-min walk from the Taj Mahal's East Gate. 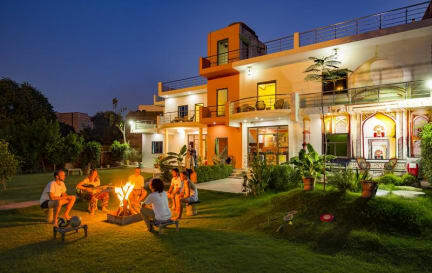 Top rated, with over 1000 reviews on HW and many more elsewhere - Zostel Agra comes with the guarantee of brand Zostel, India's largest and the oldest backpacker hostel chain. Housing a sprawling lawn and an in-house AC cafe to chill, our hostel's offerings to a backpacker are plenty. Feel free to lounge around in the lawn chit chatting with fellow backpackers over chai in summers and bonfire in winters. All our dorms and private rooms are airconditioned for that peaceful night sleep necessary to visit Taj early in the morning. Even the nearest ticket counter to Taj Mahal is located only 1.4 Km from the hostel. Our team will further help you explore Agra beyond the Taj Mahal. Take an evening boat ride with us in the Yamuna, the river which flows beside the Taj Mahal to enjoy a different perspective of the mausoleum. Make sure to meet your new backpacker friends in the hostel common room here and see the sunrise with them at the Taj the next day.